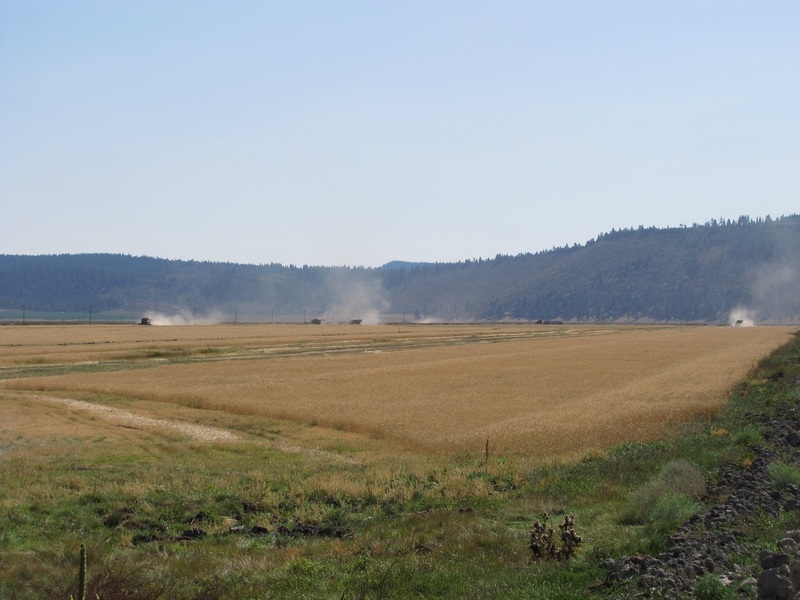 The summer sun and the click-clacking of sprinklers in the fields make July one of the greenest months in the Klamath Basin – despite the lack of precipitation. Thunder storms have threatened to drop rain, but in the end the clouds dissipate or head in a different direction. 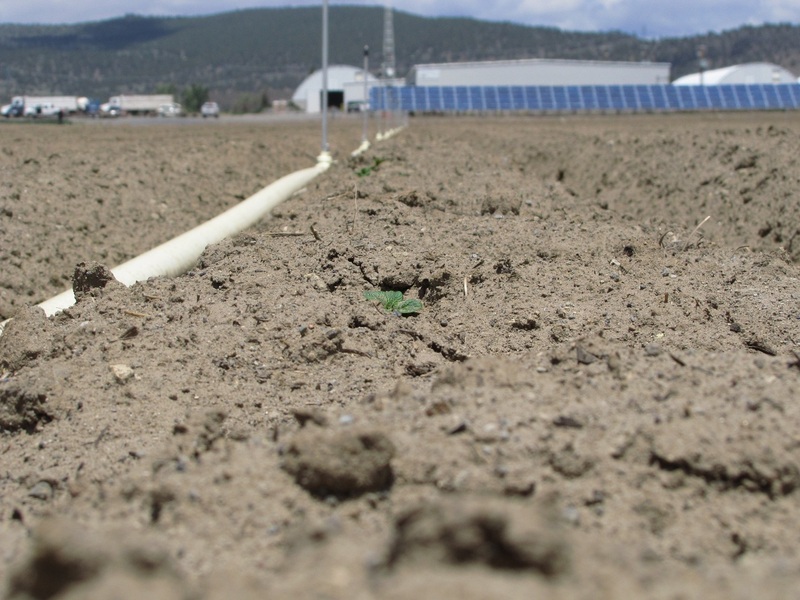 However, as long as we can irrigate, and the temperatures stay in the sweet spot, our crops will continue to thrive. With that said, we figured it was time to show how some of the fields have progressed. 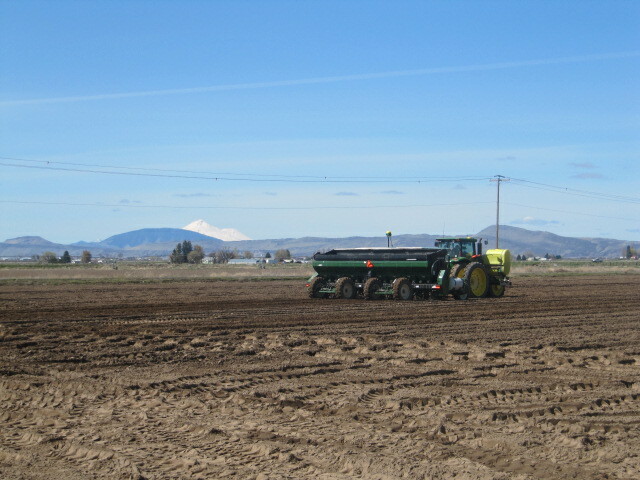 As you may recall from a previous post “Chipping Potatoes And Grain Are In The Ground!“, we shared photos we took of our fields being planted in mid-May. Since it’s been just shy of two months, it’s a good time to see how some of our fields are doing. While it’s a bit early to say how the crops will turn out at harvest, things are looking pretty good! We took photos of grain and chipping potato fields at the Running Y, an alfalfa field in Malin, a chipping potato field at our Malin potato processing plant as well as one of a grain field that was in chipping potatoes last year. 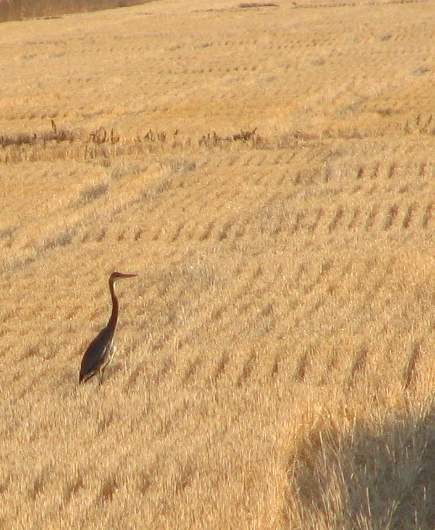 We also have some snaps of the big, dry-land organic grain field on the Lower Lake Wildlife Refuge as well as chipping potato fields at the home-place outside of Merrill. 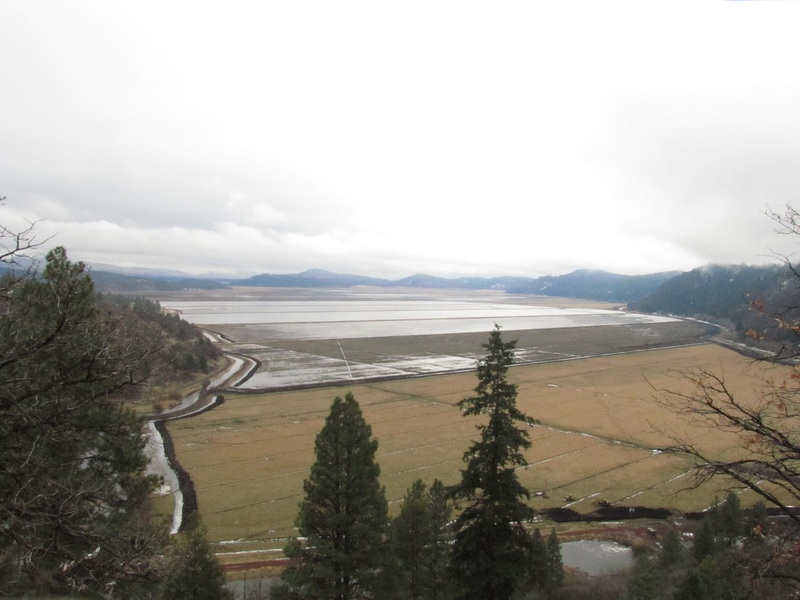 These field photographs don’t tell the whole story, and represent a fraction of the acres we farm around the Klamath Basin, but should give you an idea of what we’re seeing. Looks like the baby wheat is all grown up! Here’s the field Mr. Jepsen was checking – and it looks great! There’s blooms on these chipping potatoes! The home place potato field looks really good too! Chipping Potatoes And Grain Are In The Ground! During the hustle and bustle of shipping season, spring farming began, making the months of March, April and May some of our busiest months of the year. And as quietly as it began, last month, wheat and potato planting came to an end. This year, our crops include chipping potatoes (of course! 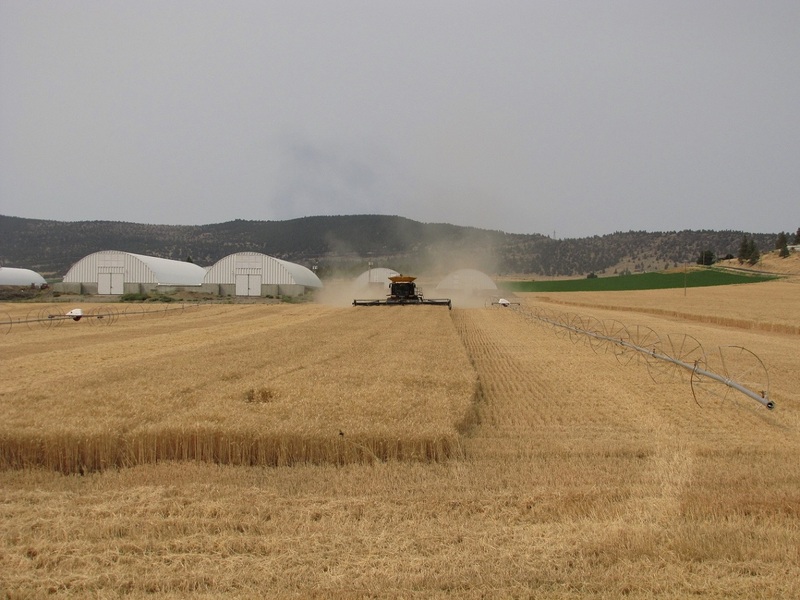 ), wheat, barley, alfalfa hay and organic potatoes. 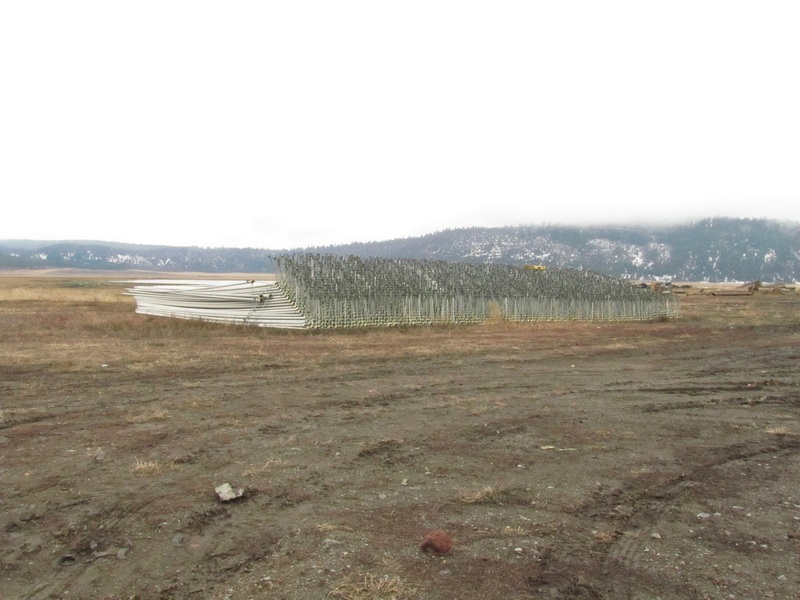 We worked and planted fields as far north as the Running Y to just over the California border on Lower Klamath Lake and in the Tule Lake leases. However, instead of telling you about farming, how about we let the photos show you instead? The following photographs were taken from the beginning to mid-May. 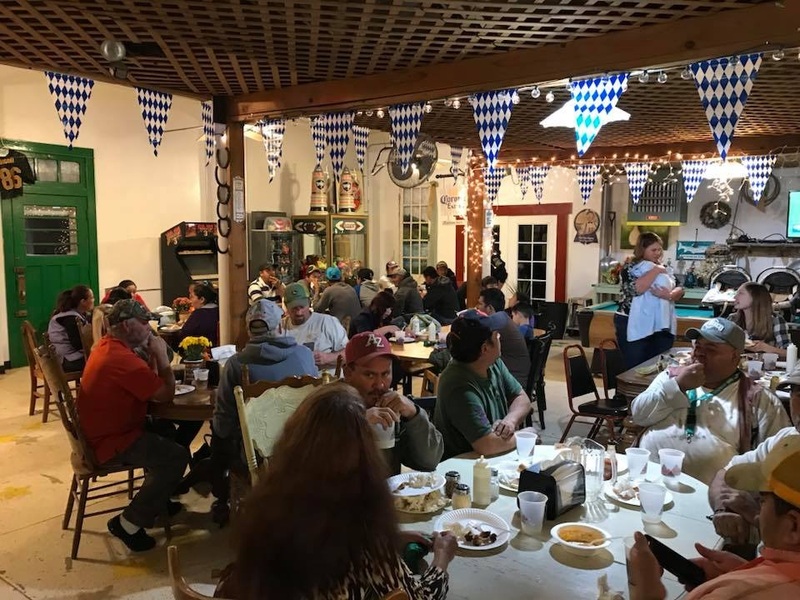 From getting stuck to happy alfalfa fields, these pictures will give you a glimpse into joy and frustration of planting season at Walker Brothers. Even Basin Fertilizer is getting in on the getting stuck! Are they deep enough, Dan? Yep – TWO planters at once! Now THAT is some fine dirt! If you look, there are two tractors in this field – it’s that big! Before we wrap up this post, John, Weston, Bill and Tricia would like to thank the planting crews for their hard work. We covered a lot of ground this year (literally), and did so through the perseverance and dedication of our hard-working crew. Thank you! Let’s cross our fingers for a event-less growing season and a fantastic harvest! As we mentioned in our last post about chipping potato harvest getting underway, grain harvest is still going on. 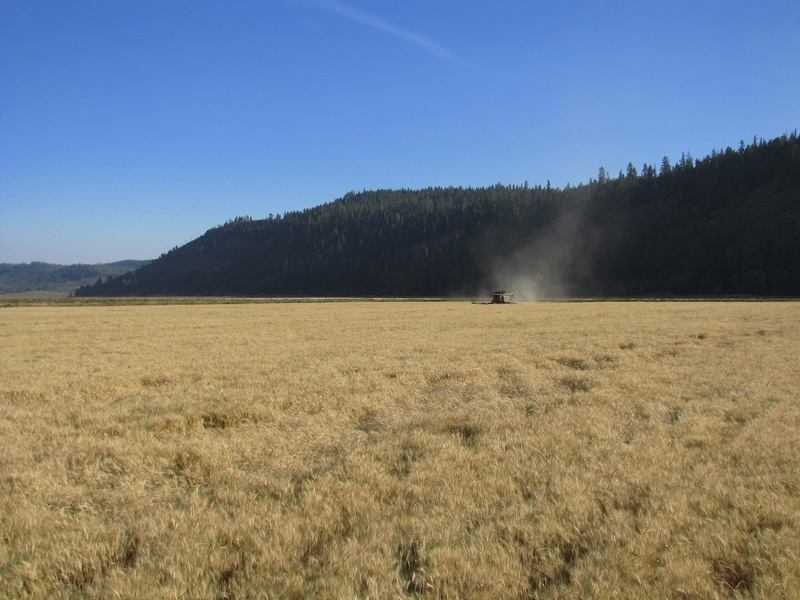 Though we started grain harvest around Malin and have worked through a gigantic organic barley field on the Lower Klamath refuge, we’ve moved our combines down to the Running Y Ranch to harvest the wheat we planted there. Though we’re proud of our chipping potatoes, raising grain is a major factor of our farming operation. 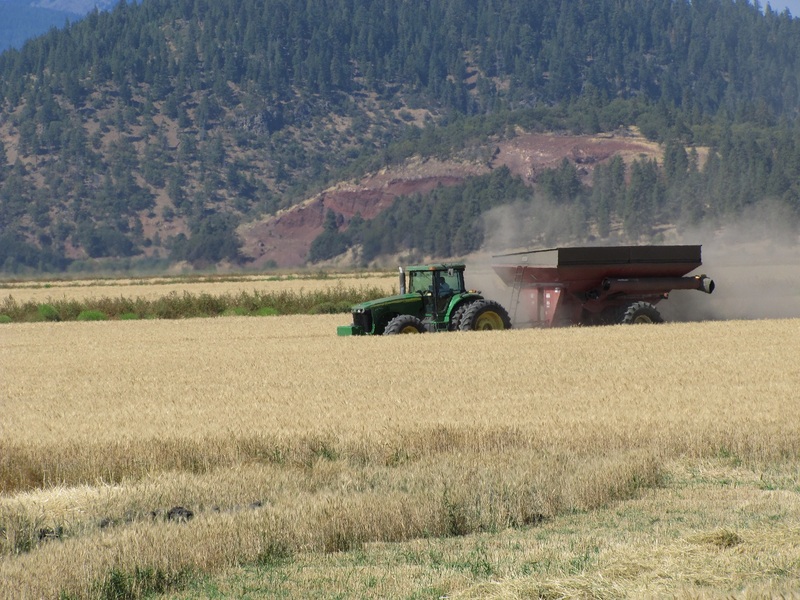 When Bill and John got together all those years ago, they focused on raising wheat, which is evident when you see the grain fields we’ve planted around the Klamath Basin. To get some perspective on the impact of raising grain on our farm, and since our harvesters and focus is on the Running Y, let’s take a quick look at how much grain we planted there. 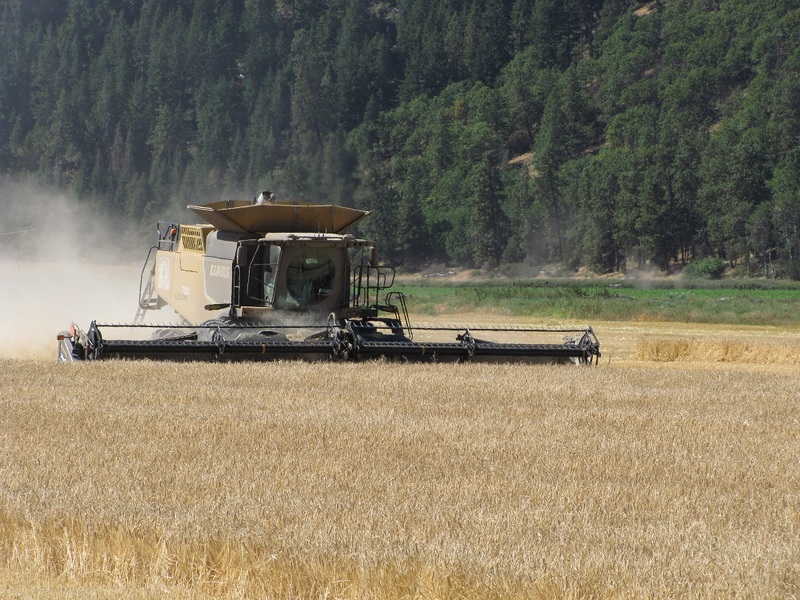 Out of the total acres we’re farming there, almost 67% of the ground is under wheat. 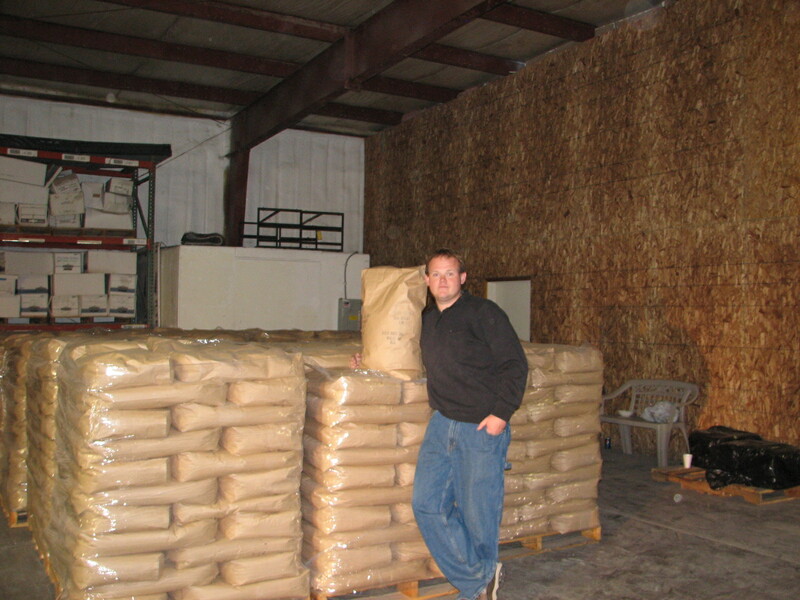 Now compare that to the other crops, we have 12% of the ground in chipping potatoes and almost 10% of it in alfalfa. 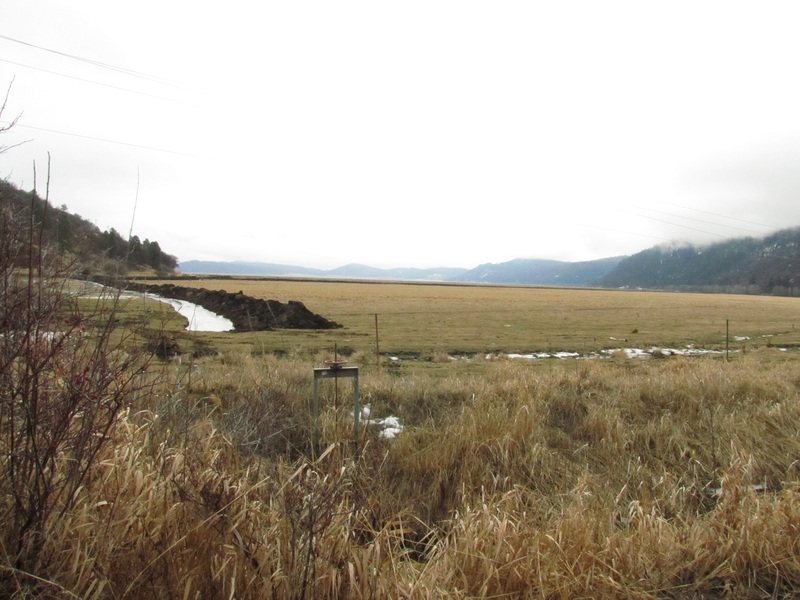 And in case you’re curious, we’ve dedicated almost 6% of the farm ground on the Running Y to the Walking Wetlands. 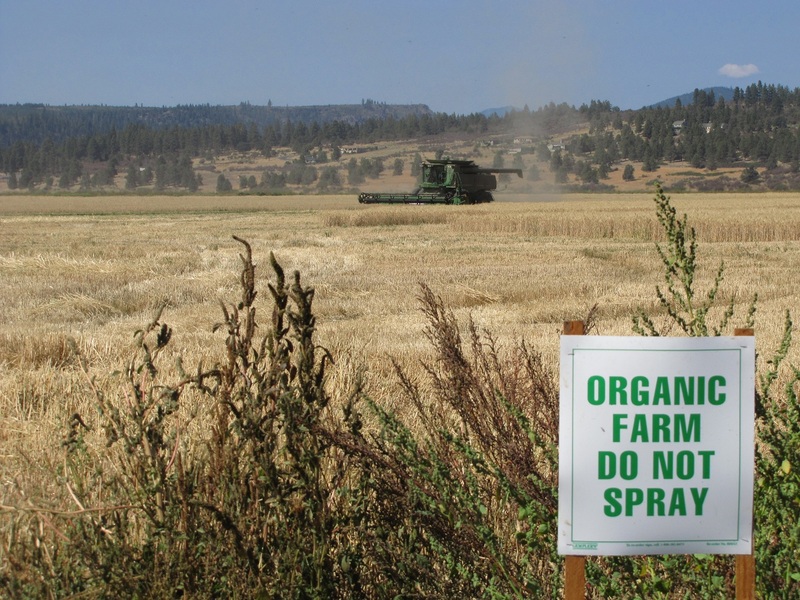 What is the percentage of acres in production that are organically farmed? 16.81%. Why so much grain? 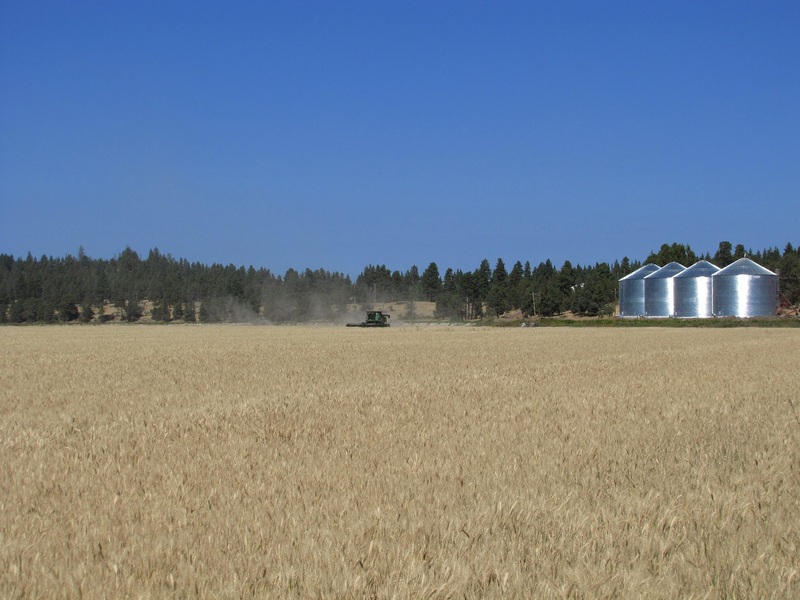 For starters, grain is a good market to be in, and John and Bill have been raising grain in the Klamath Basin since 1975. 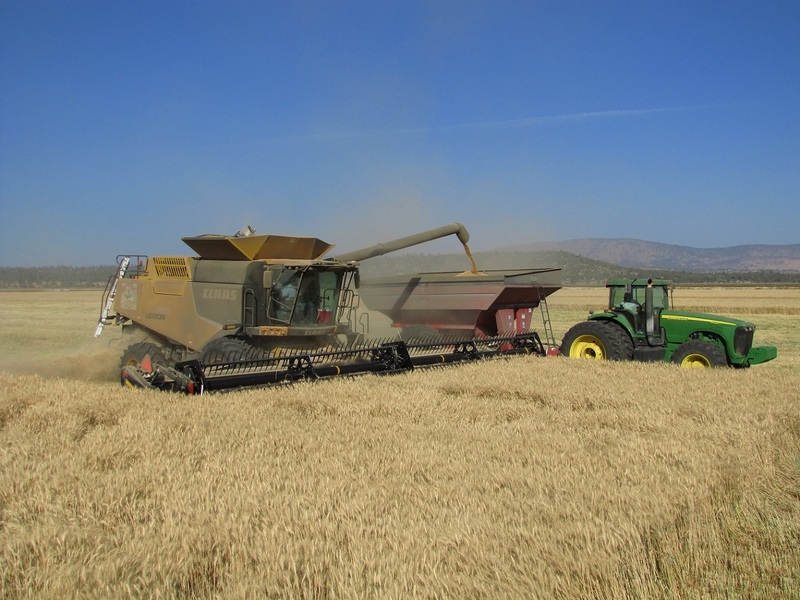 Grain farming is also a part of our sustainable farming plan. Potatoes take a lot of “power” out of the soil. 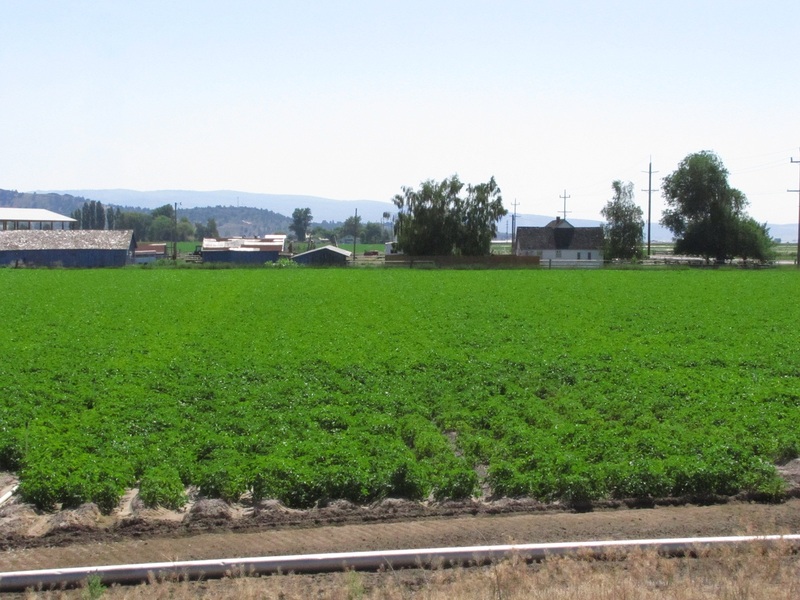 By rotating grain and alfalfa crops into fields that have either just been in spuds are or going into potatoes, we’re able to add organic material, nitrogen and other essential elements back into the ground. This makes it so we rely less on fertilizer, which is better for the environment, for the soil itself and for our operating line. 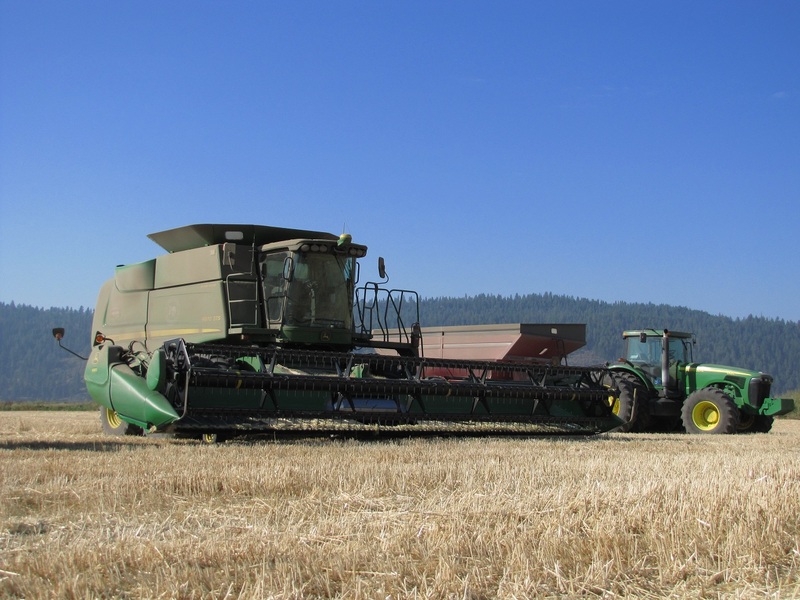 With that in mind, while we’re excited about potato harvest, we have to remember how important grain harvest is to our farm as well. Let’s hope the skies stay blue, the grain continues to ripen nicely and we get the crop into storage safely. Here’s to heavy yields! When these guys get busy, we won’t be able to get this close! The grain carts were busy in this field! That’s a pretty good looking organic grain field! 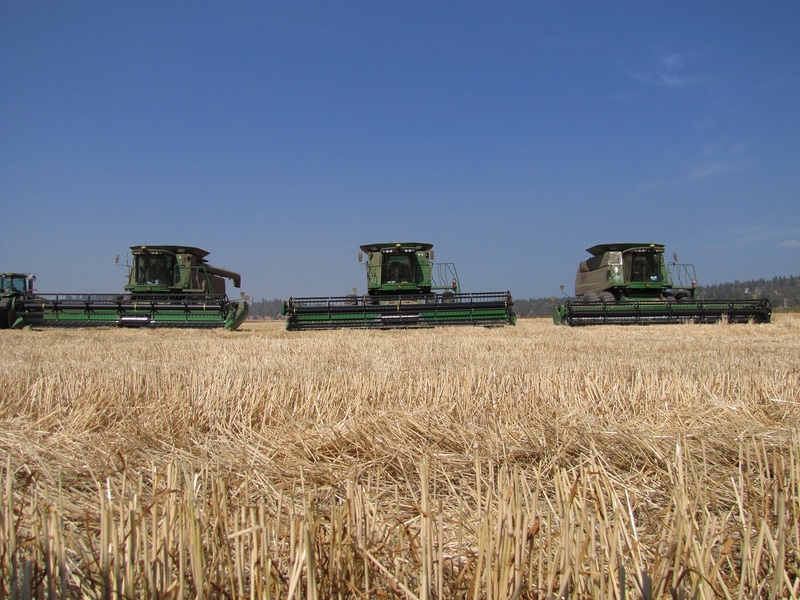 Three harvesters working one field – what a beautiful sight! 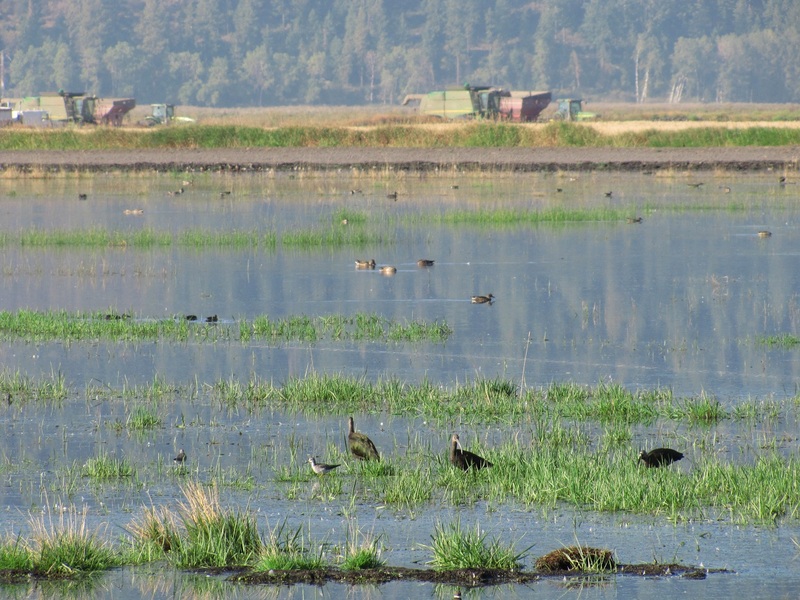 These ducks don’t seem to mind grain harvest at all! 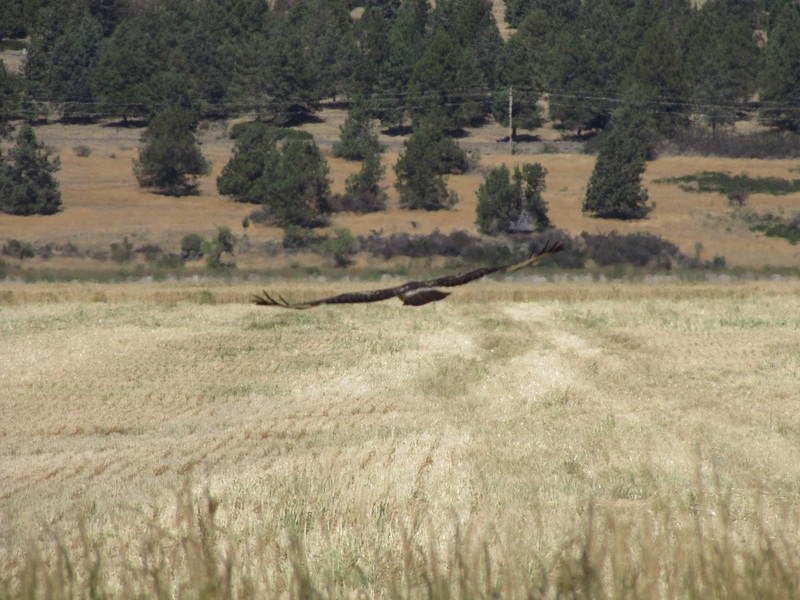 Can you guess why hawks love grain harvest? 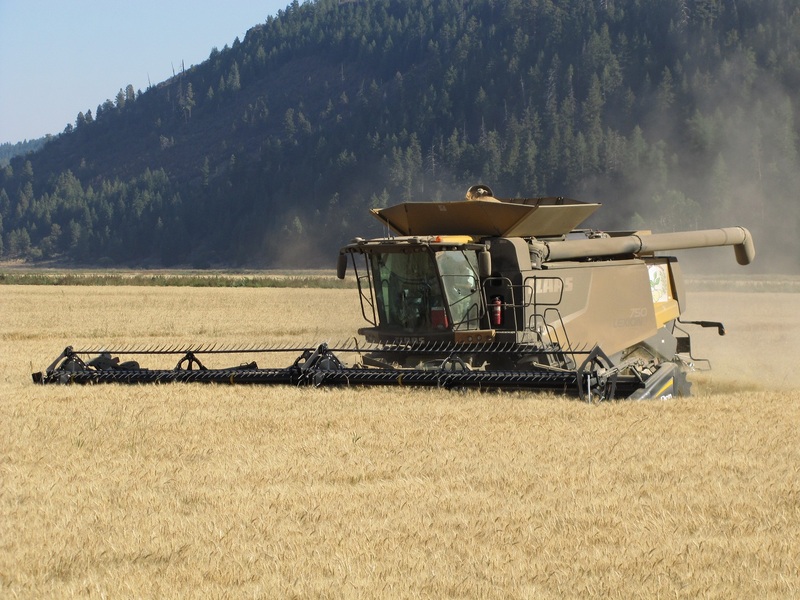 Does this Lexion 750 harvester make our grain cart look small? Know what you call this boys? Teamwork. And here’s the John Deere harvester we’re leasing. So yeah, to us, size matters! 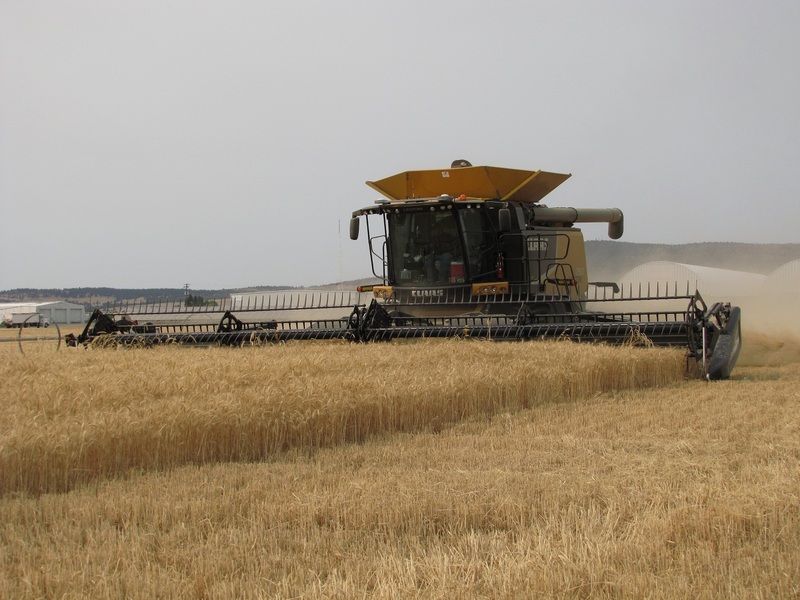 Driving around the Basin, fields of ripening wheat, barley and oats are turning from green to gold. Combines are appearing almost from thin air, lining roads and sitting in front of shops and sheds being prepped for cutting. In some fields, you can see where farmers took test passes. 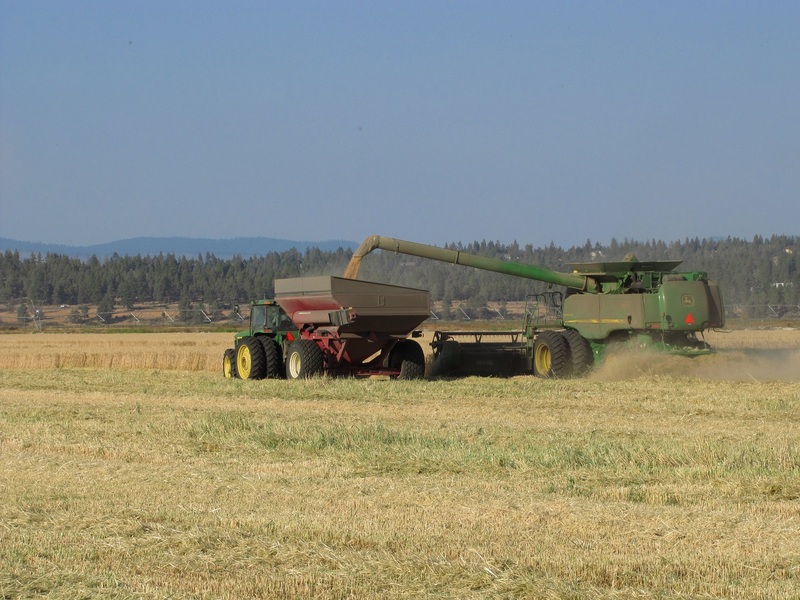 As summer ends, grain harvest begins. 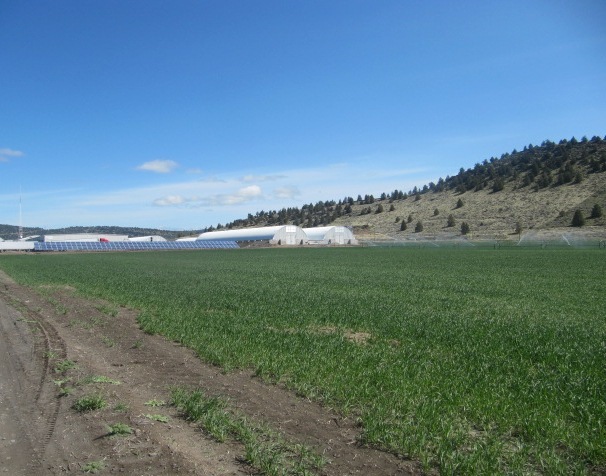 At our potato processing plant, we cut the wheat field directly south of the packing shed and solar panels. 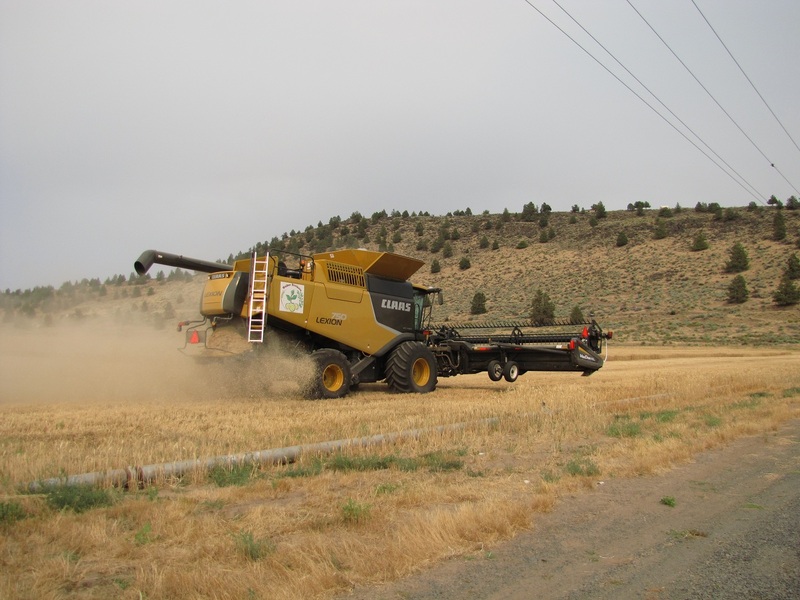 Our big Claas with its 40 foot wide head made short work of the field, starting just before lunch and finishing the same evening. 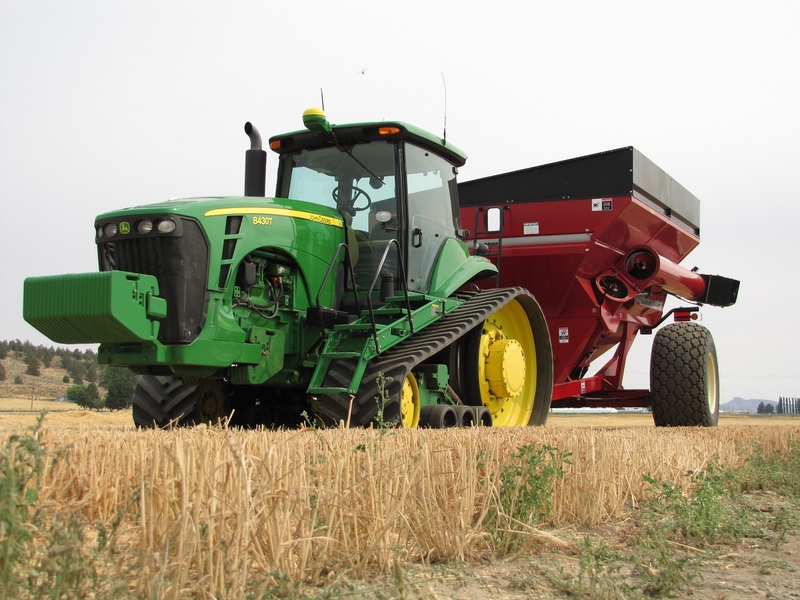 To truly appreciate the efficiency of the combine, you have to be in the field and watch it work. 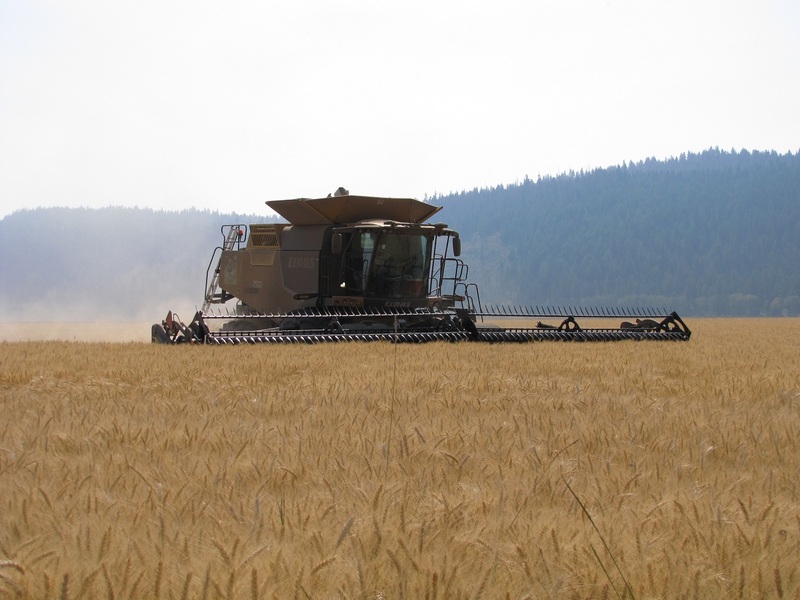 Modern combines with their floating heads and GPS units are able to cut grain just inches above the ground and maximize the amount of crop cut on each pass. 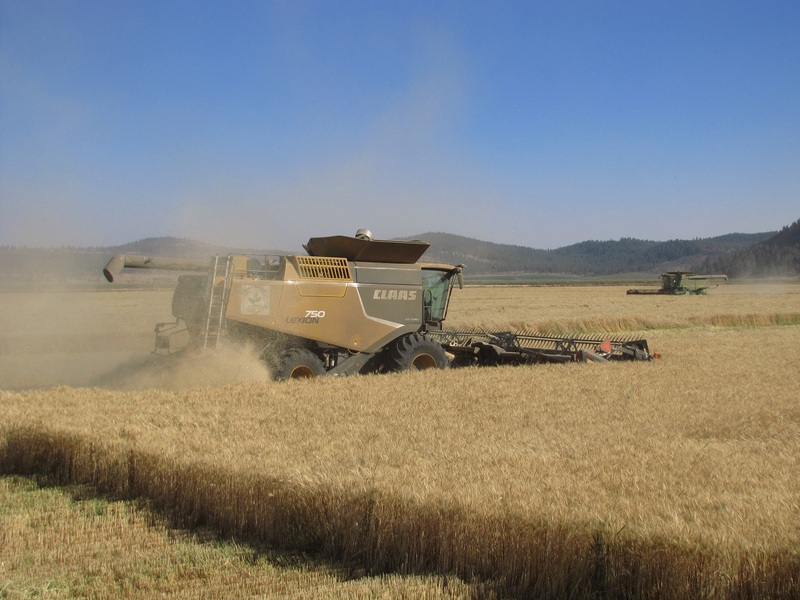 This machine not only allows us to harvest our grain in a more efficient manner, but we also are able to collect more of the grain cut. While this is our first field harvested, it is certainly not our only field. After this one, two other fields are ripe and ready to cut – and those are just the ones ready in the immediate future! 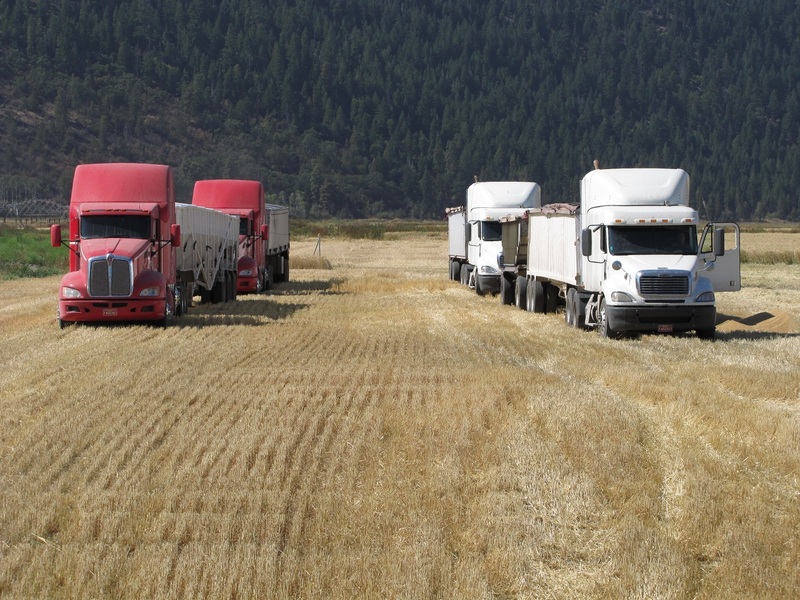 As August rolls on, you’ll see our grain trucks running from the fields to storage and our grain carts toted out to help collect the crop. 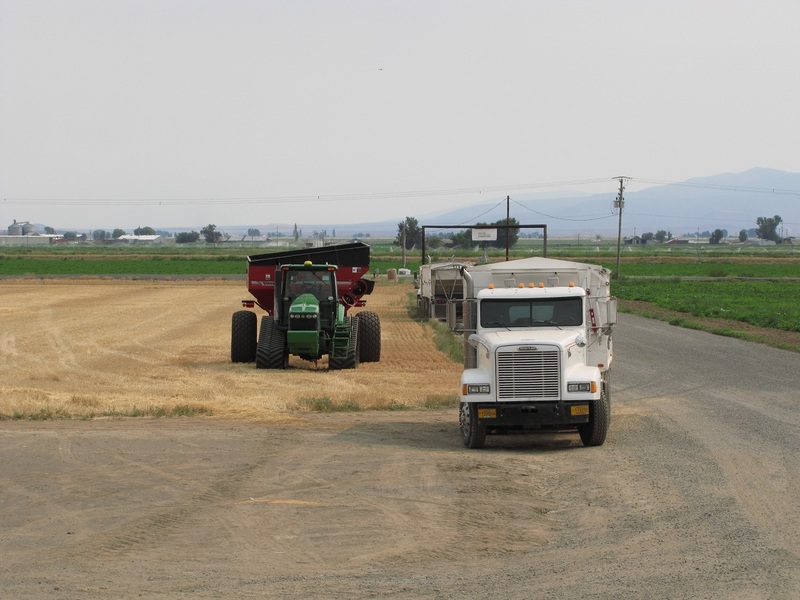 Though we spend a lot of time discussing chipping potatoes and writing about our packing shed, grain and hay are a part of the crops we rotate though in our sustainable farming plan. So wherever you see a grain field, a potato field was there once! 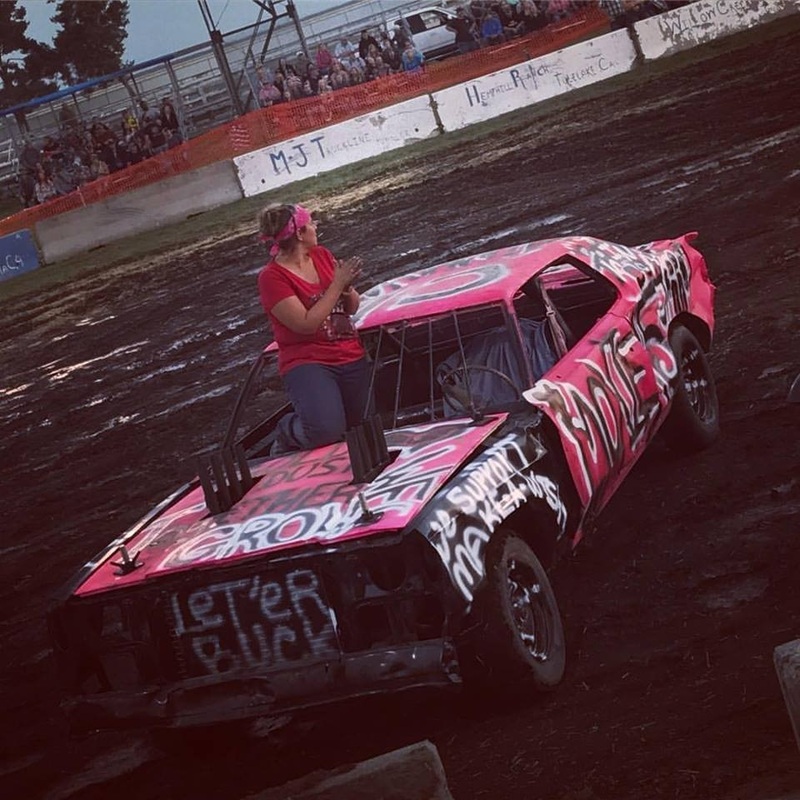 Check out how low that header is! The old saying goes, April showers bring May flowers. And for farmers, sometimes those very same April showers that bring the flowers (and much needed precipitation) can bring headaches as well. However, despite a wet beginning to the month, we have been planting potatoes. Since mid-April, our tractors and planters have been in the fields getting this year’s crop of chipping potatoes in the ground. Fields that aren’t being planted in spuds and are not already growing alfalfa are being drilled with wheat. With the Running Y added to our acreage portfolio, it’s taking an extraordinary amount of coordination and communication to keep our spring farming on track. 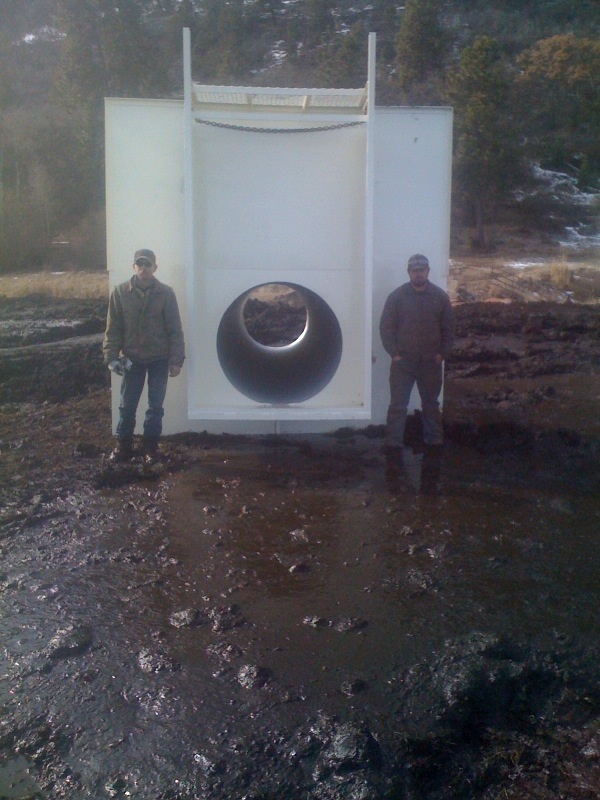 And with the typical Klamath Basin spring (which means it’s not typical at all! ), it’s also requiring a little bit of patience as well. 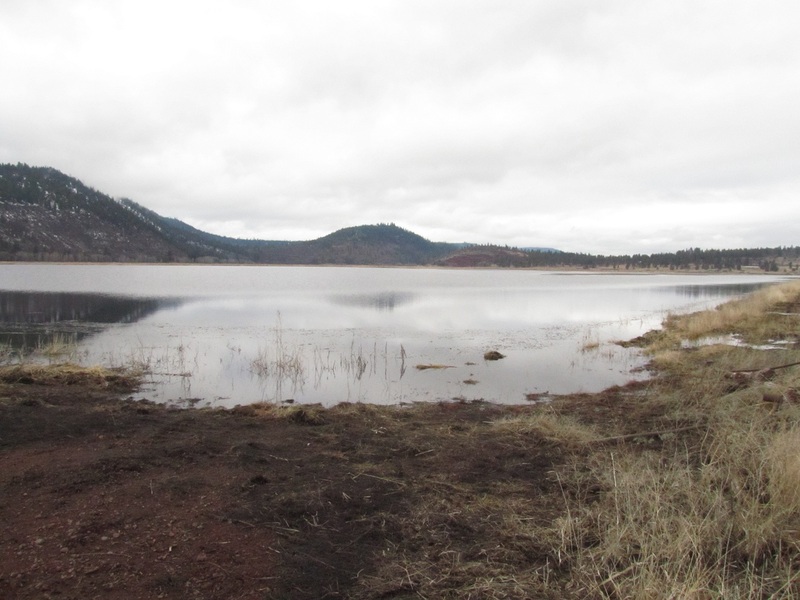 While much of the focus is on the ground and what’s going in it, all around the Basin the signs of spring and the promise of the season to come are sprouting up all around. Winter wheat is peaking through the soil while the alfalfa and other hay fields are well above our ankles. These green reminders mixed with the rich browns of freshly farmed soil make the Klamath County landscape one of the prettiest places to be this time of year. No wonder we love what we do! What a beautiful day for planting potatoes! We’re Farming The Running Y! Welcome to the Running Y Ranch! If it’s been a secret, it isn’t one any longer. 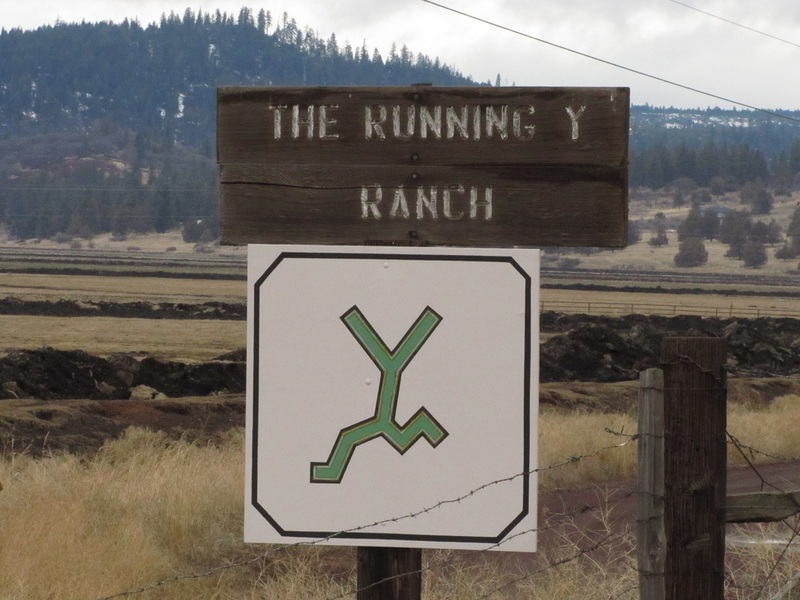 After evaluations, negotiations and many meetings, we’ve struck an agreement and will now be farming the Running Y Ranch! It’s a move that we’re very excited about and feel that for the long-term success of our farming operations, it is right in line with remaining sustainable for many, many years to come. You’ve seen us mention the Running Y before in blog posts and press releases about our annual Open House Field Day. The Running Y Resort is where we treat our attendees to an afternoon of golf followed by dinner after spending the morning checking out our fields and packing shed. So, are we farming the golf course? Of course not; that would be silly. 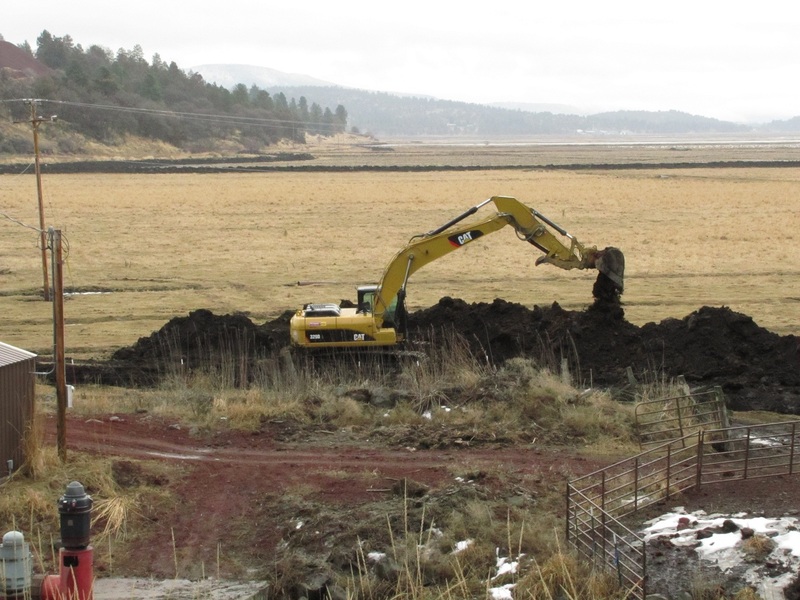 The fields we’ll be working are located just across from the resort on the Running Y Ranch. 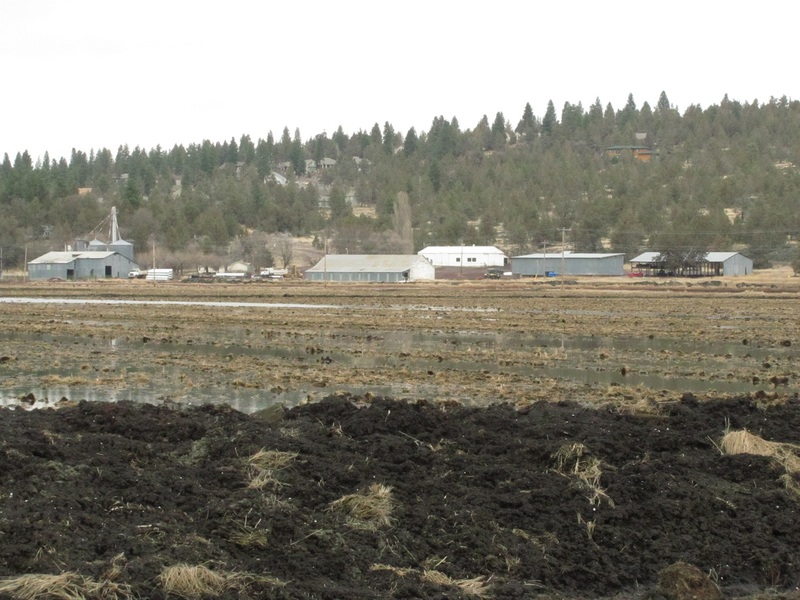 And while it may seem like it’s a long ways from our storage and packing facilities in Merrill and Malin, it turns out it’s not any further than some of the ground we farm near the Lava Beds in California. 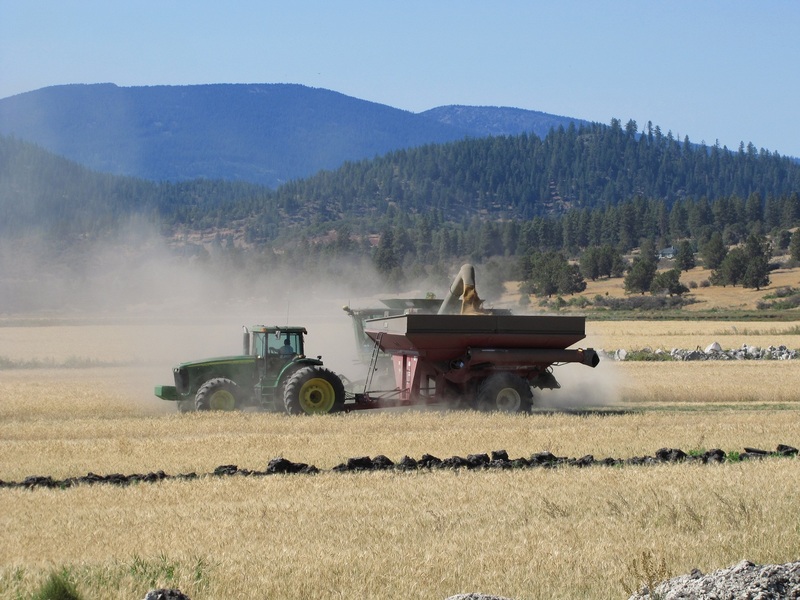 The rich, peat dirt is some of the best farmland in the Klamath Basin, and while large portions of the ranch have been in pasture for a while, in no time those grounds will be producing hay, wheat and chipping potatoes. Add in the wells located on the premises and it only looks better from where we’re sitting. However, securing the ground doesn’t mean we’re guaranteed success. 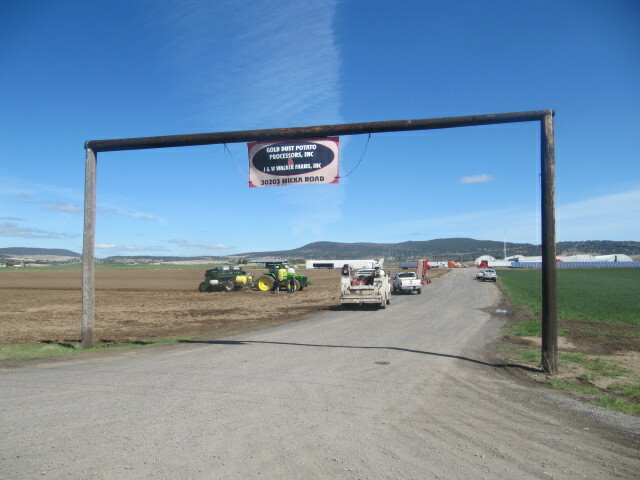 As you’re reading this, the Walker Brothers crews are at the Running Y Ranch getting it ready for spring farming. Over the constant, raucous calling of migrating snow geese, you can hear the din of equipment running. 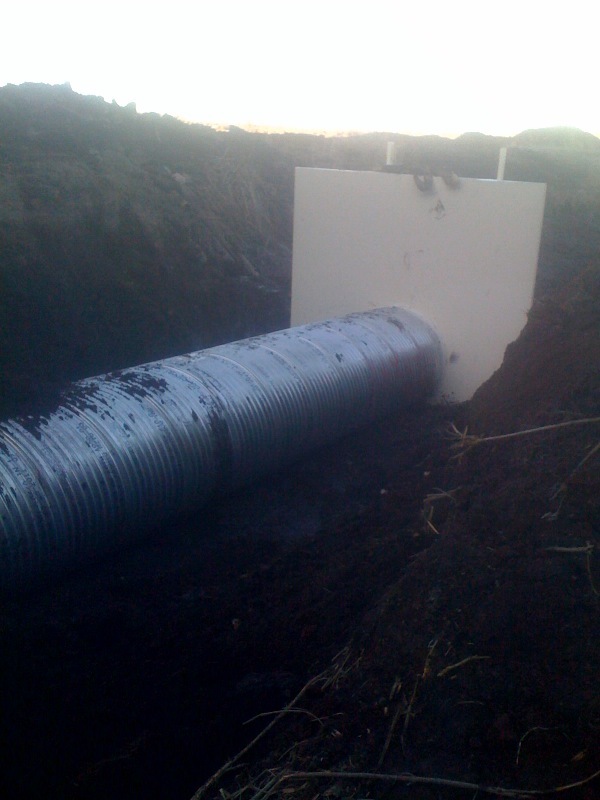 Irrigation canals and ditches are being dredged and readied, faulty head gates are being replaced and old, crushed culverts are being removed. 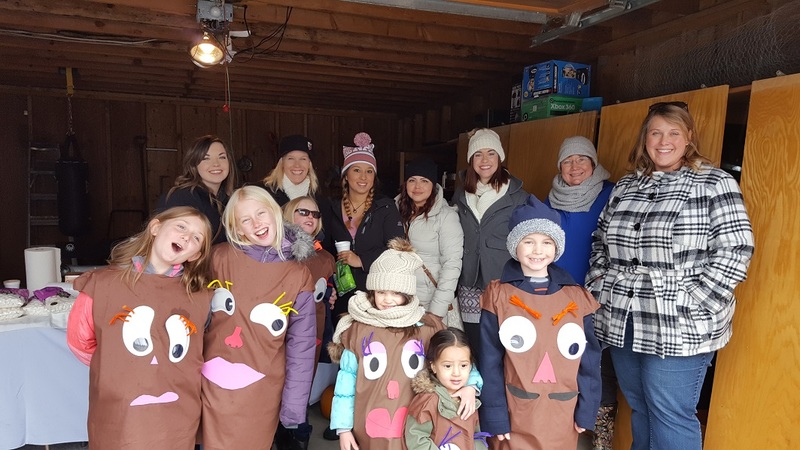 Though the general perception of farming is that farmers and crews have pretty relaxing winters, at Gold Dust and Walker Brothers winter is just the season you’re busy with getting ready for spring planting. While we want to farm the Running Y because of the rich farm ground and the availability of water, it’s hard to ignore the natural beauty of the place. The little valley is surrounded by tall stands of pine and fir trees where it’s easy to find deer and elk tracks. 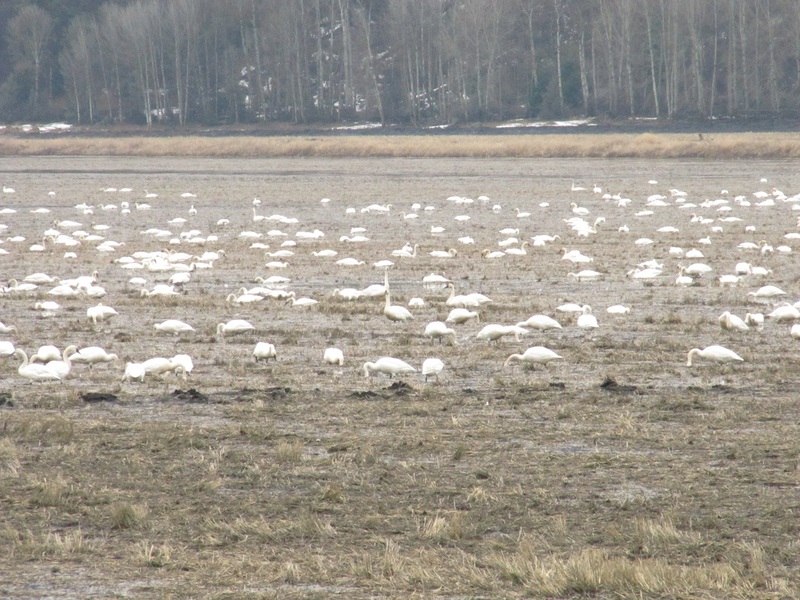 In the fields themselves, snow geese, bald eagles, herons and cranes abound while on the perimeter songbirds and hawks watch the action. 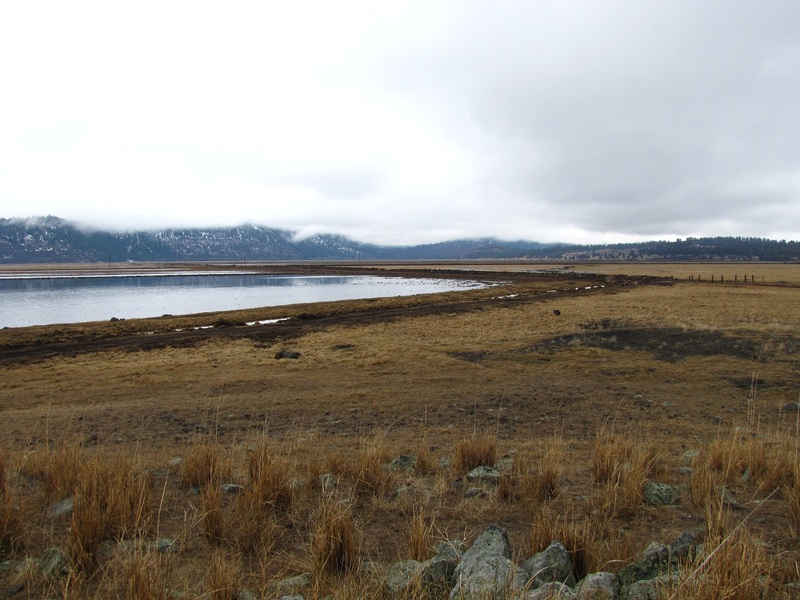 All in all, it’s a picturesque place that makes us thankful we get to work and live in a place as beautiful as the Klamath Basin. We’re farming all the fields you can see in this photo. Yes – all the way over there! Loud and beautiful, snow geese love this place! No, seriously – this is a headgate. A very, very, very large headgate. He was quick, but not quick enough to avoid having his picture taken! 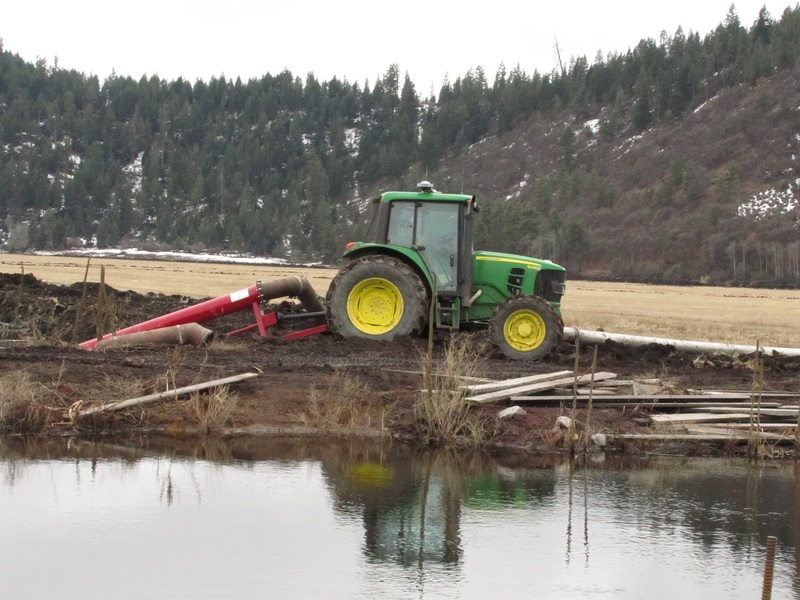 Who needs pumps when you have a John Deere?
. . . And now you don’t! Walker Bros Win Environmental Stewardship Award! 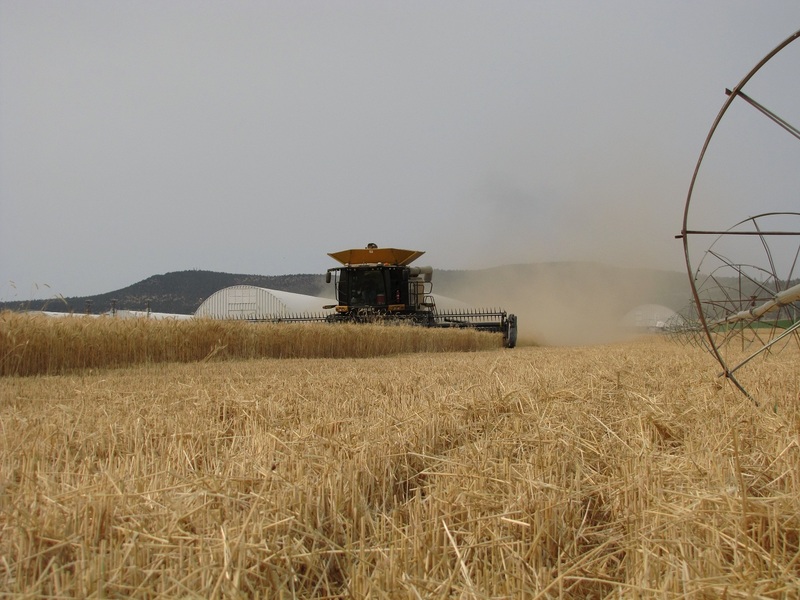 Grain stubble provides protection against wind erosion. We are very proud to announce that the National Potato Council has honored Walker Brothers with a 2010 Environmental Stewardship Award. 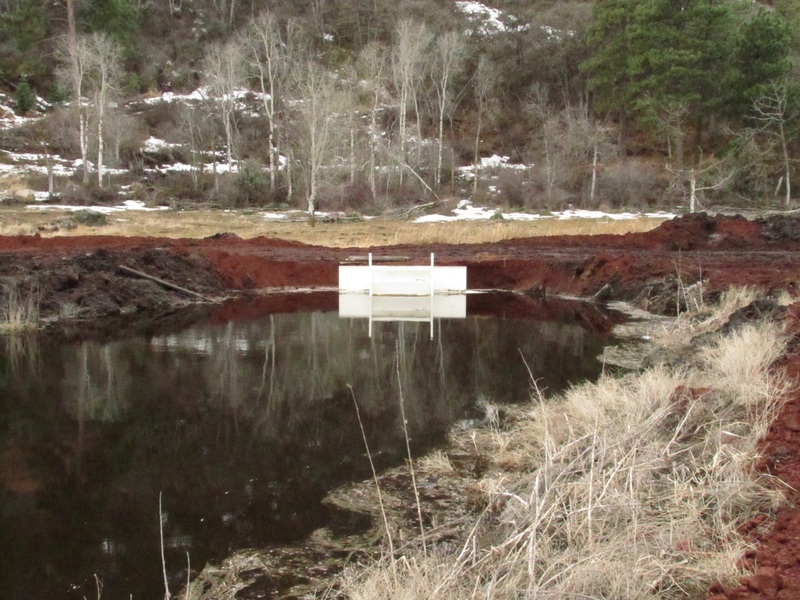 While it’s always nice to be recognized, to receive recognition from the National Potato Council for our work on providing cleaner water and wildlife habitat as well as for preventing soil erosion feels extra good. 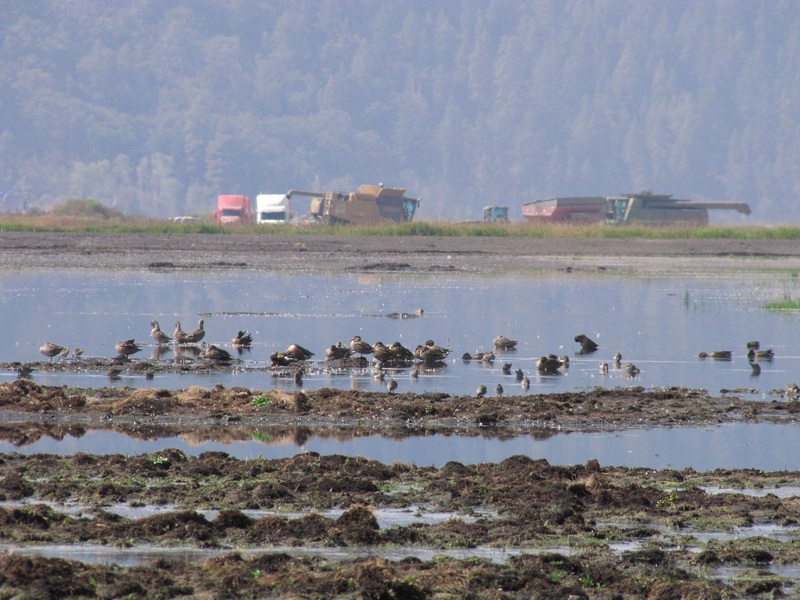 Part of the requirement to win the award was to maintain a high crop yield while implementing practices that protect the environment and wildlife. With both our chipping potato crops and wheat crops, we were able to do just that. 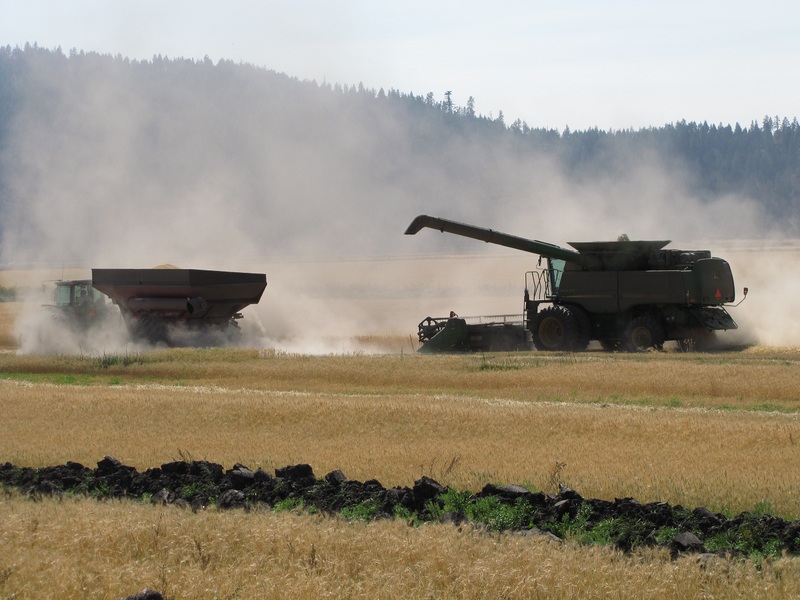 Aside from the tried and true practice of crop rotation, when planting we used no till drills for the wheat which minimized erosion during planting. As for the potatoes, GPS was used to plant the rows closer together, which helped minimize pesticide use and erosion. 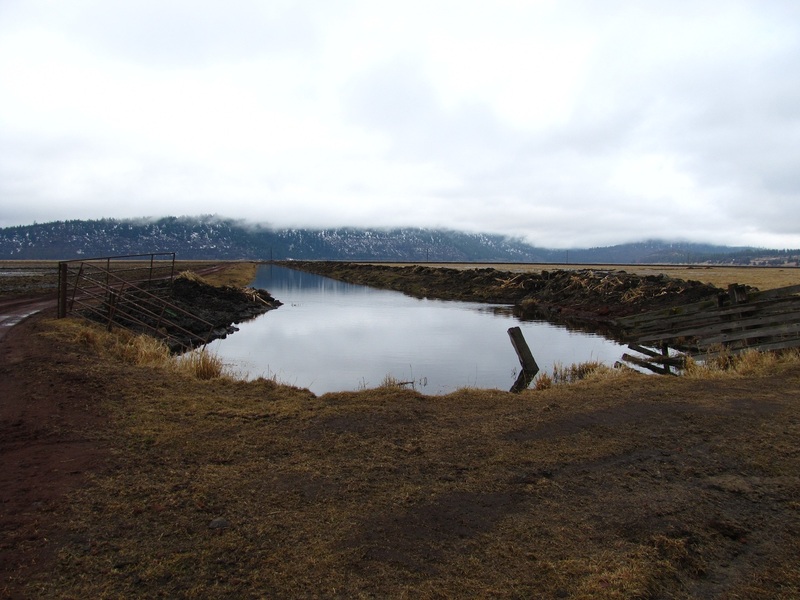 After planting the spuds, a few days later the fields were irrigated in order to reduce wind erosion. For pest management, Walker Brothers used a couple of techniques other than better planting methods. One was to plant 42 foot wide stretches of rye and grass around the fields to attract good insects as well as to encourage bad insects to leave the crops alone. 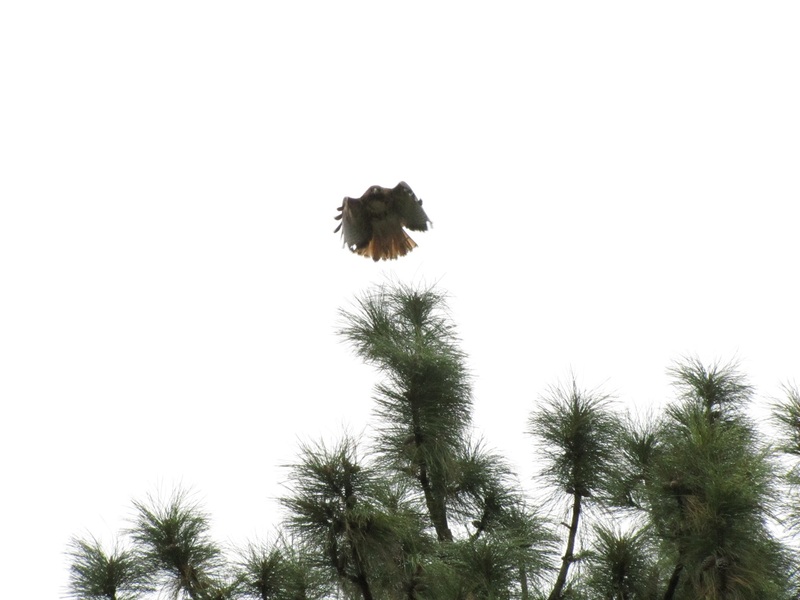 Not only did this help with bugs, it also provided habitat for birds. 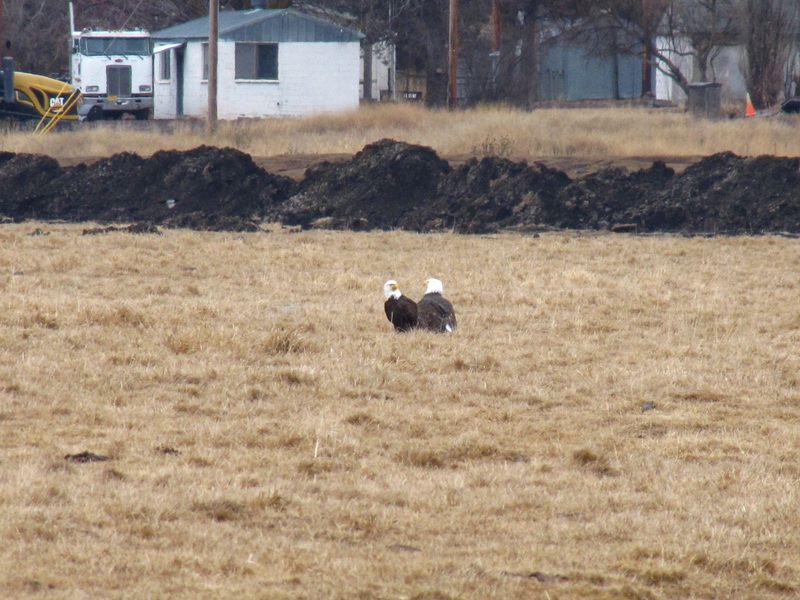 Speaking of birds, we participated in the Fish and Wildlife Service’s Flood Fallow program. 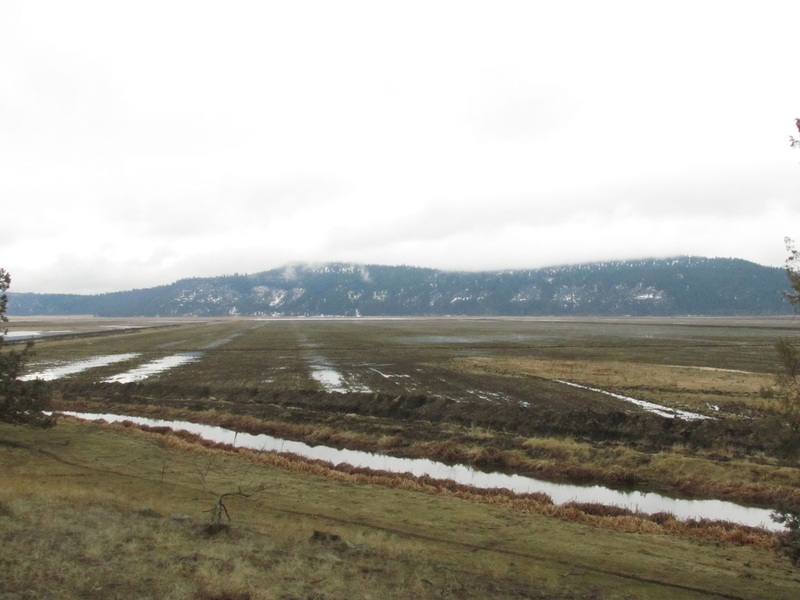 We voluntarily flooded fields, which provided habitat for migratory waterfowl that summer in the Klamath Basin. This gave the birds a place to hang out as well helped clean the water and returned important nutrients back to the soil. 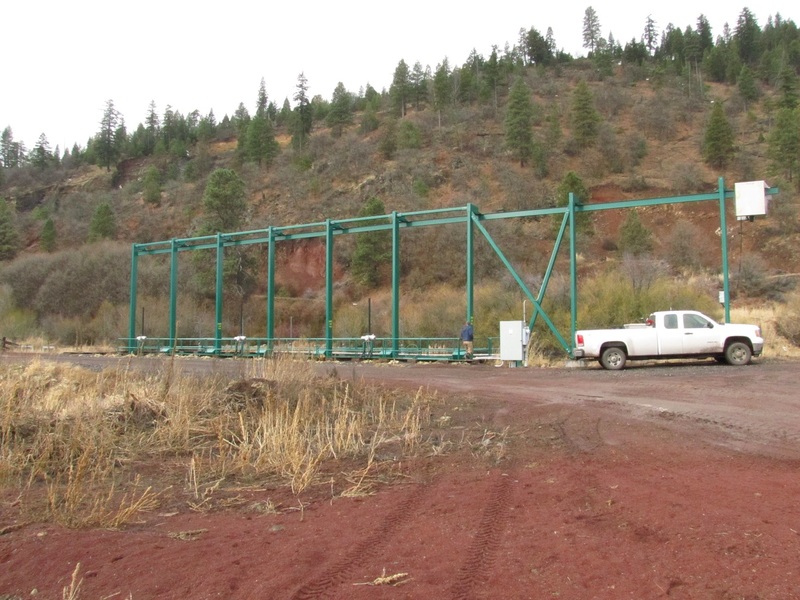 This also gave human visitors to the leases something to look during the Walking the Wetlands tours. 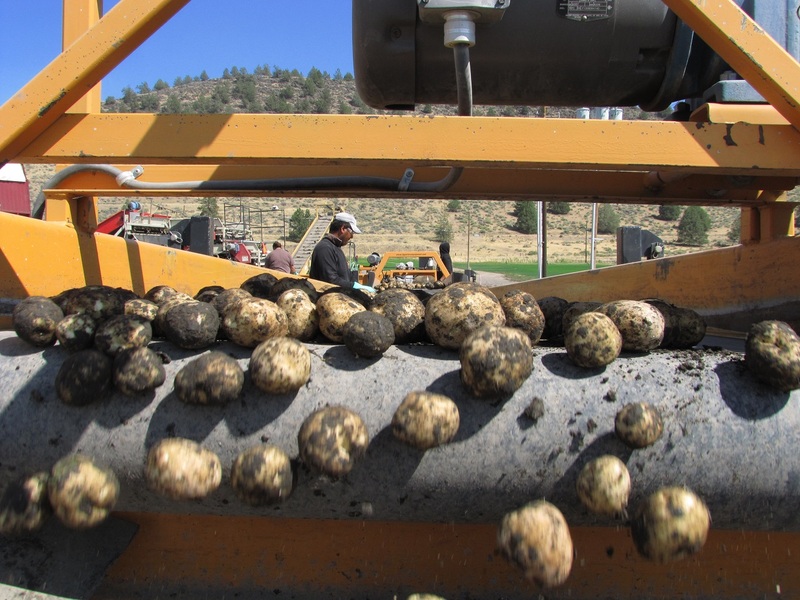 After implementing the above methods and other techniques and technology, Walker Brothers still harvested over 60,000 metric tons of chipping potatoes. So, at the end of the day, we not only had an impressive yield but we also cut down on the amount of fertilizer and pesticides we used and helped make our little part of the world a little better (and cleaner!). We would like to thank John and the farm crew for all of their hard work in implementing these practices. We would also like to thank the National Potato Council for this award and we look forward to officially receiving it in Vegas in January at the 2011 Annual Meeting! 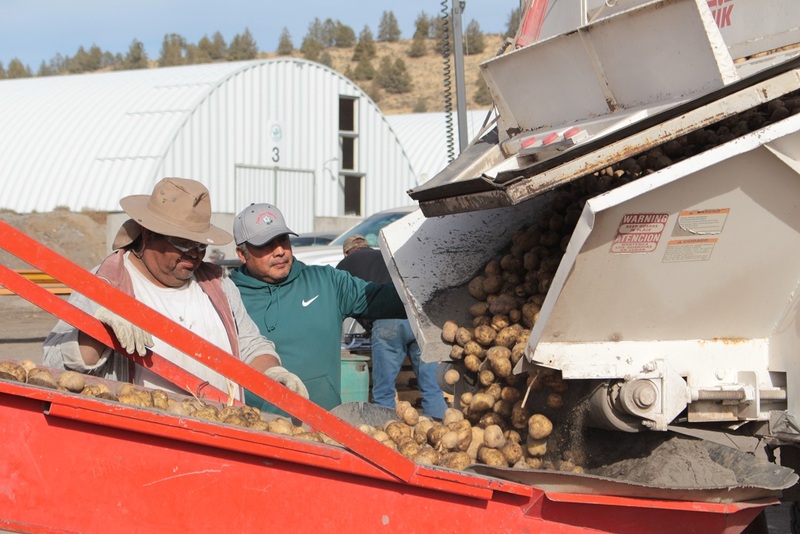 For more details about the award, be sure to read our press release about receiving the National Potato Council 2010 Environmental Stewardship Award. Gold Dust Ships First Container of Wheat! Need Wheat? Talk to Weston Today and Save! 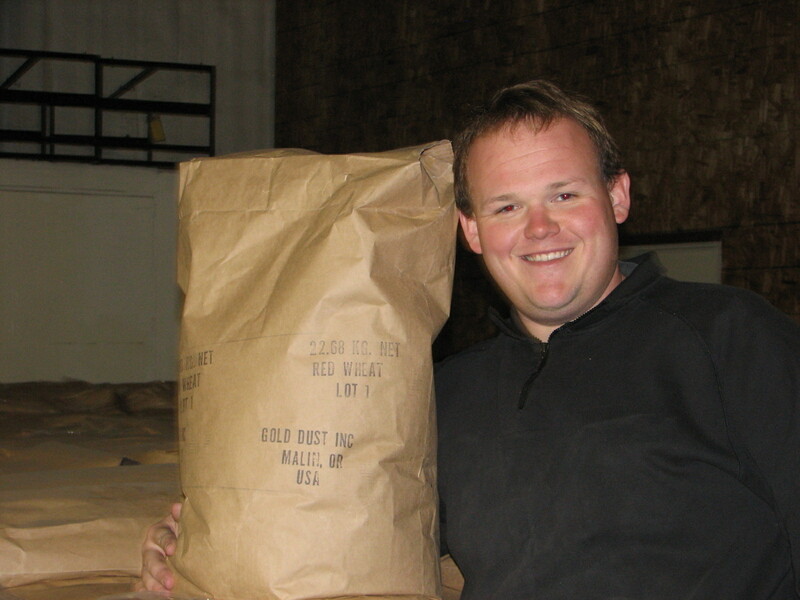 Today marks another first for Gold Dust and Walker Brothers Farms. 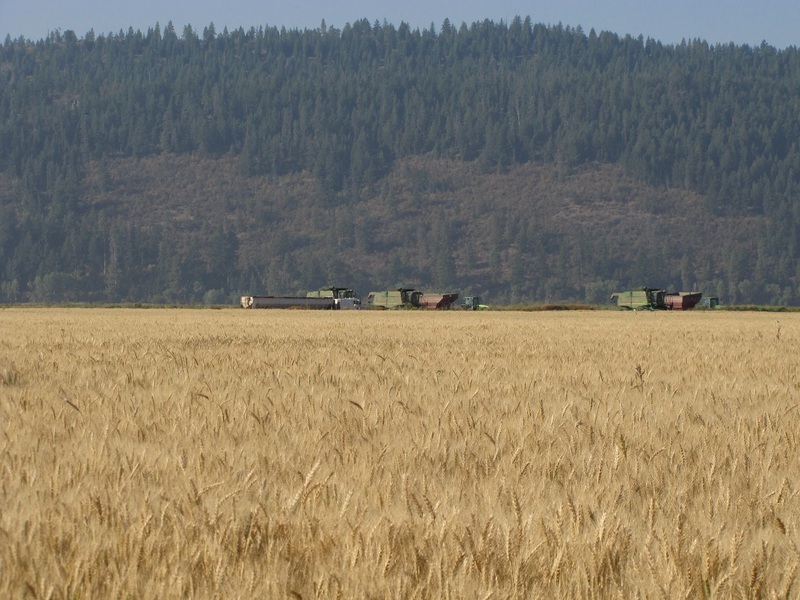 For the first time in company history, we are shipping grain from our processing facility in Malin, Oregon, to South East Asia. While we’ve been in the grain business for years, this is the first time in our company’s history that we’ve shipped wheat ourselves, let alone overseas. This is the first shipment of what we hope turns out to be many. 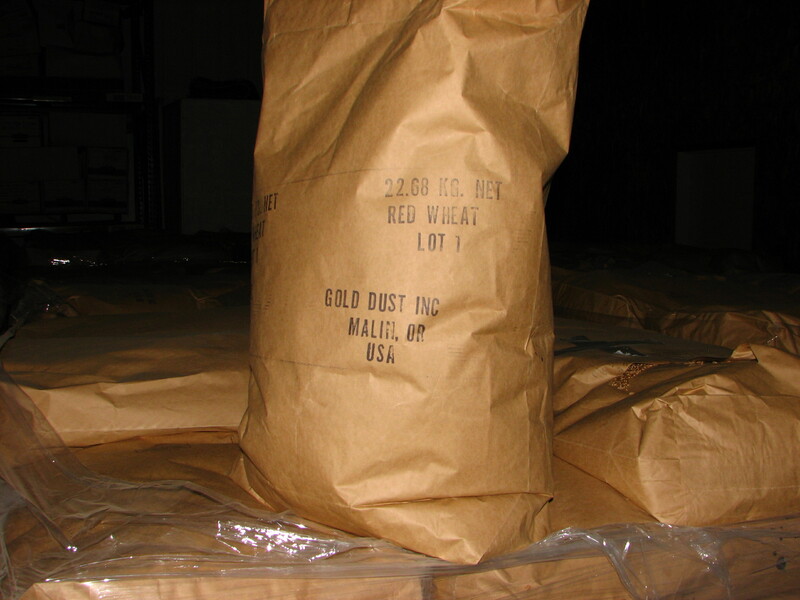 Weston, our international salesman, said the shipment is a container of a northern spring wheat we call “Gold Dust Red Wheat”. It’s been cleaned and is ready for processing into natural, whole-grain snacks. 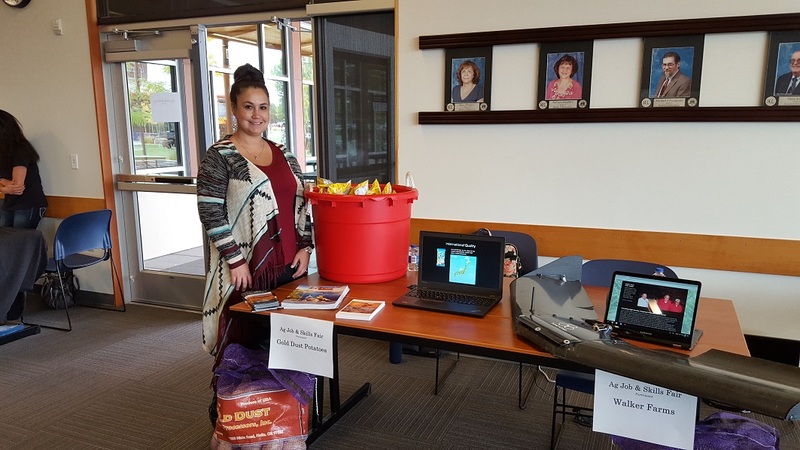 So far, the primary use of our “Gold Dust Red Wheat” is for whole grain snacks, such as Frito Lays’ multi-grain SunChips® snacks. Visitors to our site and blog may have been under the assumption that Gold Dust and Walker Brothers Farms only deal in chipping potatoes. 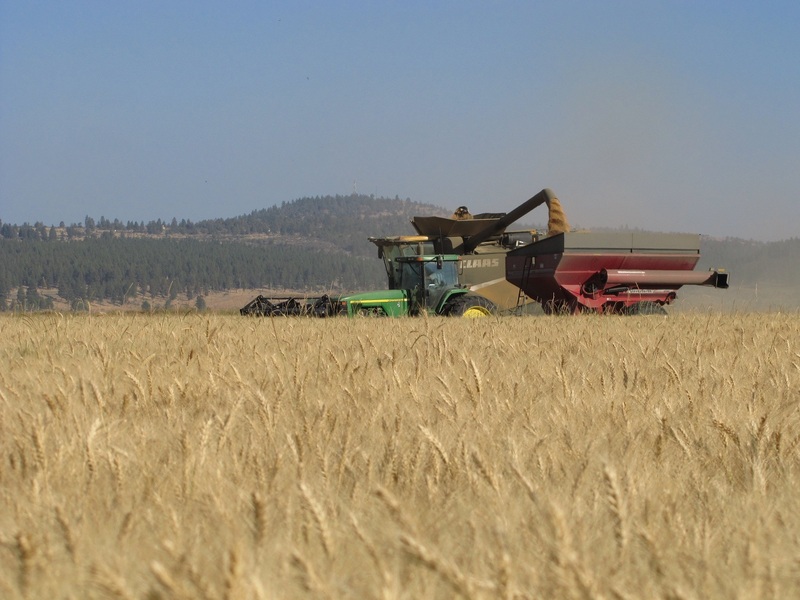 While it’s true that much of the focus is growing, processing and selling chippers, John and Bill have been growing and selling wheat since the 1970’s. 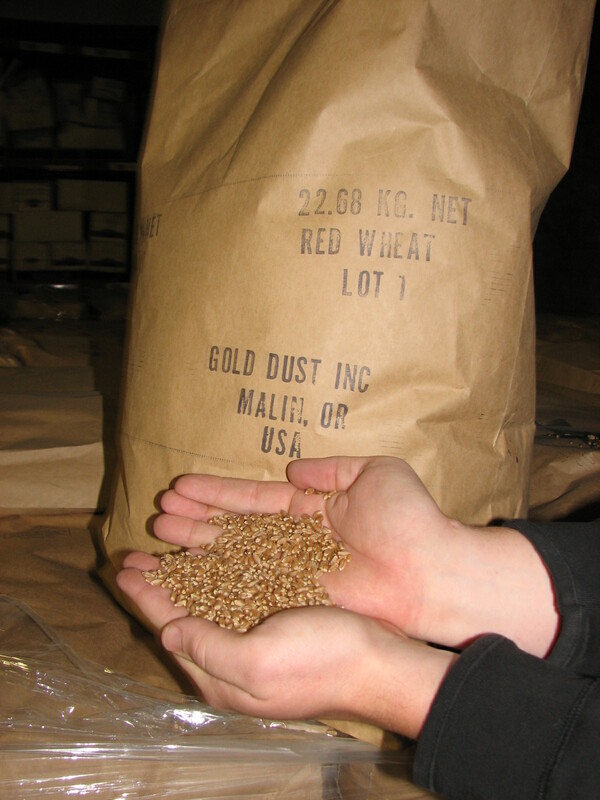 With this much experience in raising wheat, our customers can expect the quality of our “Gold Dust Red Wheat” to meet their expectations. 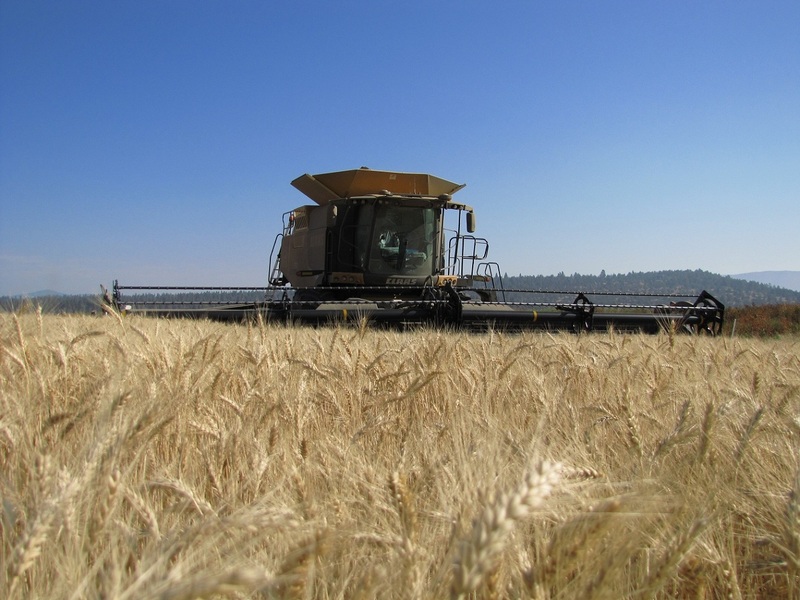 We have plenty of wheat to meet this year’s orders. 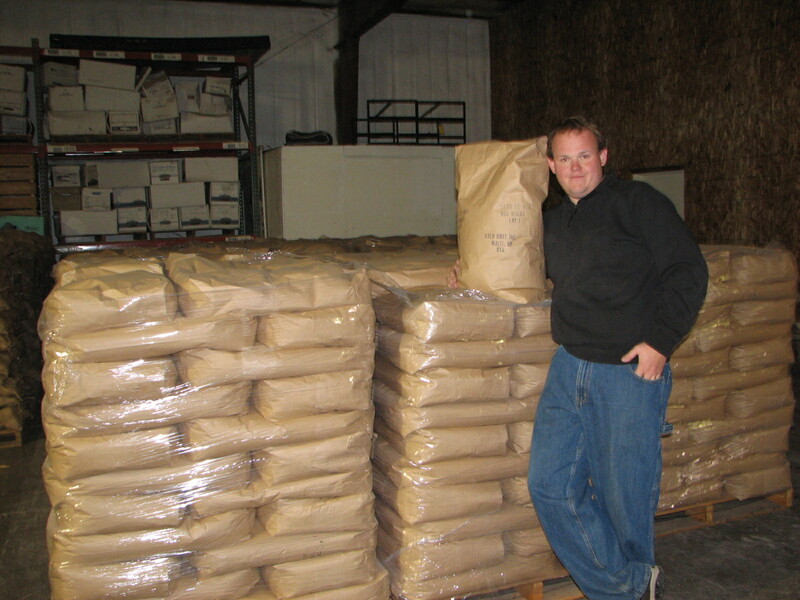 If you’re interested and would like a sample, contact Weston in our wheat and potato sales department. 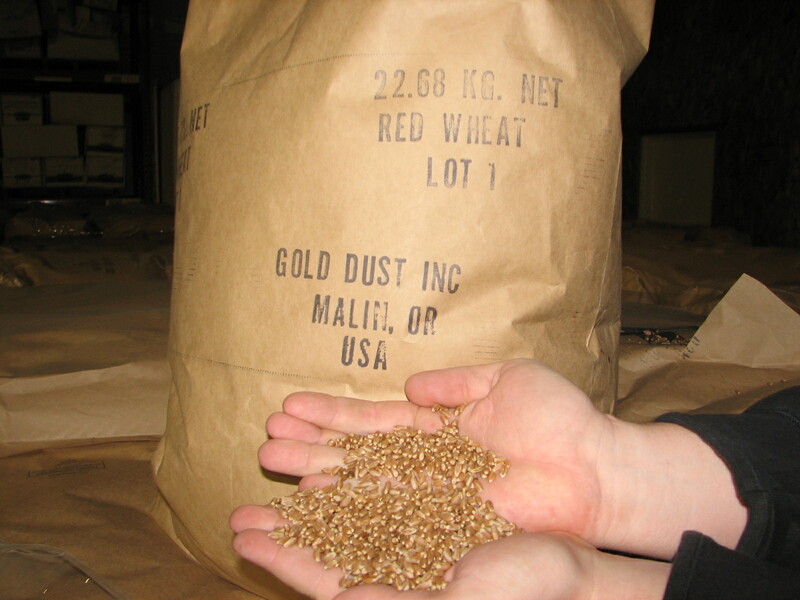 He will be more than happy to send you a sample of our “Gold Dust Red Wheat” and talk to you about pricing. Since you’re dealing directly with the grower, and not any middle men, you can be assured of big savings as well as excellent customer service. Need Wheat? Talk to Weston!